A special Thank You to Puffin Books for sending me this book for review. I LOVED Matched and was eagerly awaiting Crossed. There is no doubt that Condie can write. It is a beautiful book, laced with poetry and feeling. It was just too slow for my taste. I felt like nothing was really happening. Ok, maybe small bits here and there, but it felt like this was a filler to get us to the goods in the 3rd installment. I was expecting more from the romance too. It was just slow. Really, really slow. I was expecting much more suspense. I have no doubt that many people will enjoy this book. I'll be tuning in for the finally, I'd like to know what happens with the Rising! "Cassia and I sit as near to each other as we can. She leans into me and I keep my arms around her. I don't fool myself that I hold her together- she does that on her own- but holding her keeps me from flying apart." 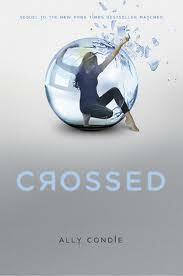 I'm still waiting to get hold of a copy of Crossed! Pacing issues aside, I'm glad it's good. Now all I need is to go buy it! Yes, you need to buy it! It is such a good series so far. I am enjoying all these dystopians since The Hunger Games. I like that they give me something to "think" about. Isn't that what reading is about anyway?! I thought it was slow, but many people did not. I'm just so anxious to find out what happens!